The San Jose Sharks cruised through the first round of the playoffs at ease. Game 4 recap, analysis and more. After winning the first three games of the series against the Anaheim Ducks, the San Jose Sharks looked to sweep the series at home on April 18th. They say the fourth game is the hardest to win, and that would be a good way to summarize the game between the two teams. As Anaheim put up a valiant effort and fought until the end, the Sharks found a way to pull off the win and impressively defeat the high-seeded Ducks in four straight games. Even though it was a do-or-die game for the Ducks, they didn't really come out with much fire during the early parts of the game. They were very passive and did not manage the puck well. It's hard to say that the Sharks were much hungrier either, but like all series long, they were able to capitalize when the opportunity presented itself. The Sharks were able to open the scoring off a turnover in the neutral-zone, as Marcus Sorensen jammed a loose-puck past John Gibson at 5:43 to give the Sharks an early lead. The Ducks did not do much to respond the rest of the period as both teams mitigated each other's chances leading to a rather uneventful first stanza. The Ducks came out with much more jump in the second and perhaps played their best period of the entire series. Once again Martin Jones was the star of the show, as he continued to frustrate the Ducks save after save, and looked almost impossible to beat at times. Jones made several highlight reel saves on the Ducks barrage of opportunities, including this spectacular save on Corey Perry. Jones did not break when his team needed him the most. In all fairness, if he didn't play the way he did, the Ducks could have easily come out of the period with two-goal lead. Overall, chances were pretty even for both teams. The Sharks also had chances of their own to extend the lead but Gibson did his part in keeping his team in the game with timely saves. Note: Corey Perry looked to have scored the tying goal at the end of the second, but luckily for the Sharks, the time expired before the puck crossed the line. Perry was held scoreless in the four-game series. It was "now or never" for the Ducks and they came out guns blazing in third. Rickard Rakell seemed to have finally scored the game-tying goal for his team, but after further review, the goal was taken back due to an offside violation. It was just that kind of night for the Ducks. But the third time was the charm, as Andrew Cogliano was finally able to get the equalizer at the 7:53 mark. The goal seemed to have tilted the ice in Anaheim's favor as they were pressing for the go-ahead goal. 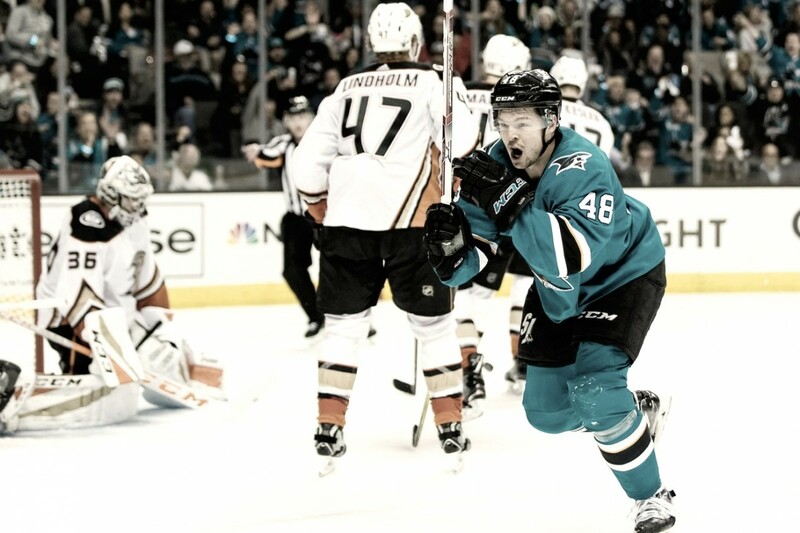 However, the burst of momentum was short-lived as Tomas Hertl scored just 1:16 after to help his team regain the lead. Moments like this was the difference in the series. San Jose was consistently able to weather the storm and make the big plays when needed. The series turned out a lot different than many expected. Many expected a much closer series. It was somewhat of a surprise to see the Sharks close out the series in such dominant fashion. It was even more impressive to see them do it when without one of their best players in Joe Thornton. Moving on, we have very little reason to doubt the Sharks and what they are capable of achieving in the second round. However, they will face another 4-0 team in the Vegas Golden Knights. It will be interesting to see which side breaks first in the second round. How far do you think the San Jose Sharks will go this year? Let us know in the comment section below.